The Pinch Me Planning team feels so fortunate to work with wonderful couples from all across the country, weekend after weekend, month after month, each wedding season. We spend most all of our waking minutes helping our couples plan, design, and coordinate their dream weddings in Maine. And while the actual planning and designing process is what makes our hearts skip a beat, nothing beats seeing our couples actually get to celebrate their wedding day surrounded by the people they love the most. Since we can’t invite you all to each of our weddings, featuring our work through our couples’ wedding days here on the blog is the second best we can do! And today we’re excited to share an awesome warehouse wedding that we helped design in Portland, Maine last fall. You may remember that we featured a Brick South wedding recently. Well today we’re especially excited to share with you another Brick South wedding. Molly and Marc were married in October of last year, and we had so much fun designing this wedding! For Molly and Marc’s warehouse wedding, we utilized a lot of greenery and white which we knew would look amazing against the brick backdrop of the industrial warehouse venue, but we also incorporated a touch of burgundy and blush to soften the overall look. Our team of wedding vendors came through big time to help pull off this final look. Watershed Floral created gorgeous floral centerpieces for the wedding reception, and long garlands were laid down the middle of each table for an extra punch. But the floral details didn’t stop there. The team at Watershed Floral also adorned the chandeliers hanging above the reception, which we still can’t stop looking at. In addition to the design details of this wedding ceremony and reception, Molly and Marc’s warehouse wedding in Portland was truly one of a kind because there were so many amazing personalized elements. The couple incorporated Molly’s family bible, which is over 100 years old. Multiple generations of her family have all held and signed the bible on their wedding day, and Molly continued to carry on this touching family tradition. Another personalized element was the vellum accent piece added to the reception menus that described donations being made to Marc’s late father’s non-profit. And lastly, there was the absolute labor of love that was the letterboard seating chart. Molly’s sister volunteered to create this as part of her bridesmaids duty, and the final look was clearly worth the effort. Greta Tucker did an amazing job capturing this entire Brick South wedding, and especially love these images that memorialize all of the personal touches. Now, enough of our recollection of this wedding! Keep reading to hear from the bride herself. Below we’ll share more of our favorite pictures by Greta Tucker, and share with you a fun Q&A we had with the bride Molly. Marc and I met at a 5k on a freezing cold Boston day. We had both signed up to support our mutual friend's team, but neither of us had ever run a 5k before, let alone on a 10 degree day. We both remember laying in bed that morning brainstorming ways to bail, but mustered up the strength to show up. We officially were introduced at the post-run celebration at Beacon Hill Pub, and the rest, as they say, is history. We talk about this a lot, and it is so hard to choose! Our vows were very personal, and something we will both cherish forever. The dancing was nonstop and probably the most fun either of us have ever had. But I think my favorite was sitting with my new husband at our sweetheart table, looking around at the beautiful room and everyone that is special to us having the best time, and feeling the most love and gratitude I have ever felt. When I think back to that day, that's what stands out the most. What was your favorite part about having a wedding planner :) ? Designing your own wedding may sound like a dream, but when you actually get into the details you might find yourself more overwhelmed than you anticipated. Especially if you’re planning your wedding from another state like Molly and Marc. We can help! Our approach to wedding design is fully collaborative. You’ll share your own vision of your event concept, and together we’ll make your vision a reality. And since no two events are the same, all packages are customizable to your needs. We can work together to make sure the planning process and timeline suits your needs. Review our wedding planning packages and contact us to start the conversation. 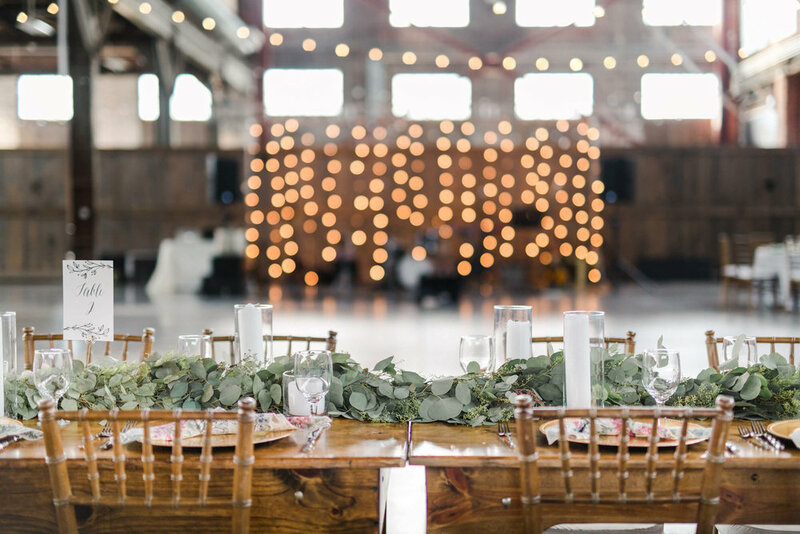 If you love the look of this warehouse wedding at Brick South, be sure to take a look at this other real Maine wedding we’ve featured on our blog. We think you might like this one too!